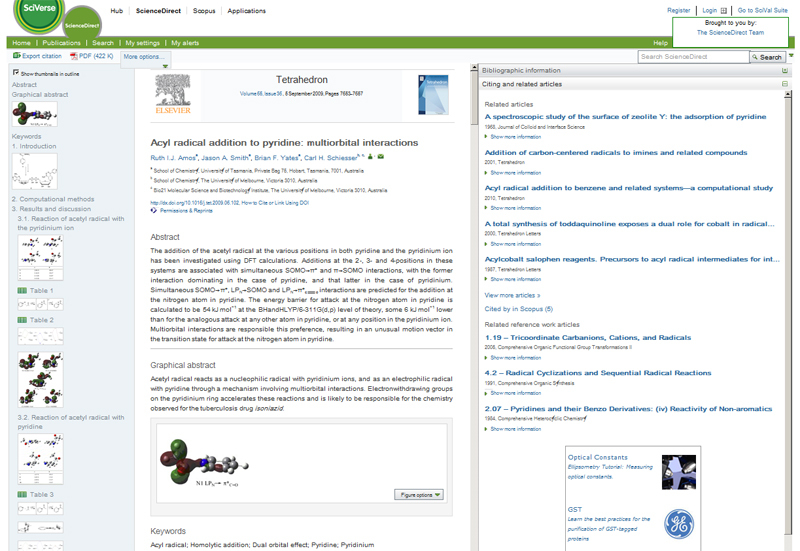 The three-pane format of Article of the Future can be seen in this article in Tetrahedron. There’s something paradoxical about being in the business of making researchers’ working lives easier, while publishing an ever increasing number of articles for them to dig through and digest. It’s all the more exciting to see that we’re actually succeeding in doing that. And we might even get better at it. This week we’re announcing the next step in our Article of the Future project, part of Elsevier’s content innovation program. Following changes earlier this year moved the article away from the traditional linear format by improving in-article navigation and readability, the article has been further transformed into an interactive HTML format. The less time researchers spend on finding and consuming information, the more time they have to be creative and produce great work of their own. Since its launch in 2010, as a pilot for Cell Press journals, the Article of the Future program has enriched the online article on ScienceDirect by making it easier to find, read, and navigate and to provide quicker access key information related to the article. While we’ve reached another milestone in implementing the program’s three-pane article format across ScienceDirect, these results are promising but at the same time no more than an encouragement to continue to enhance the online article. This is probably the most direct way of improving the researcher’s workflow. As we simply can’t advance science by making the genius minds of researchers even brighter, we might as well spend our time helping them to spend theirs as efficiently as possible. The article page redesign project is fully based on researchers’ feedback. Please feel free to share thoughts and experiences with us; it will ultimately help us help you.